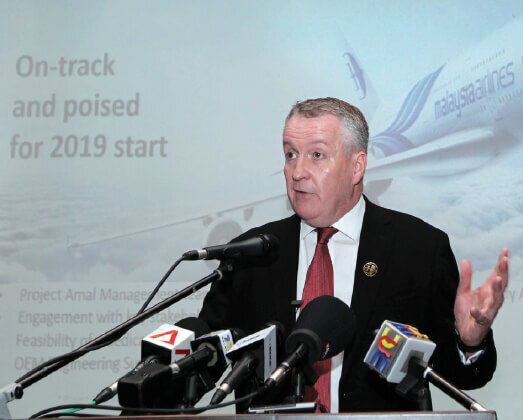 KUALA LUMPUR: Malaysia Airlines Bhd boss Peter Bellew has firmly denied suggestions that he is on the verge of leaving Malaysia Airlines Bhd to return to his former employer — Irish low-cost airline Ryanair Ltd. The Irishman said he had received calls yesterday from members of the media, asking him if he was going to leave Malaysia Airlines for the low-cost airline. “I got four or five calls [from the press] in the last four or five hours, asking me if the press conference was called to say [that] I am leaving for Ryanair. Just to make it perfectly clear, we [Malaysia Airlines] are going through some challenges at the moment, but, I am perfectly happy to be here as the chief executive officer (CEO) of Malaysia Airlines,” he told a news conference yesterday. “They have a perfectly good CEO over at Ryanair at the moment,” he quipped. “It’s the most wonderful country ... since I came to Malaysia I have put on 7kg, (and) I’ve got a loyalty card from Ravi’s Banana Leaf Restaurant in Mont Kiara,” he said in jest. On a more serious note, Bellew said he came to Malaysia for a reason, which was for the turnaround of Malaysia Airlines. “The longer I’m here, the prouder I am of the job that I am in. I didn’t expect to be CEO of Malaysia Airlines when I came here and I was very fortunate to have been given the opportunity. I will do my level (best) and work very hard to make [Malaysia Airlines] a success,” he added. Bellew took over the reins of the airline from Christoph Mueller on July 1 last year, making him the third CEO the airline has had in a period of five years. Prior to that, he had been the chief operating officer of Malaysia Airlines since Sept 1, 2015. Bellew brings with him over 20 years of aviation industry experience. He joined Malaysia Airlines from Ryanair, where he had served in various roles with increasing responsibility since 2006. He left Ryanair as the director of flight operations, being responsible for 72 bases, operating a total of 320 aircraft.